I’ve been waiting for some time to share this simple, wonderful recipe with you. I’ve mentioned that my husband’s favorite food is salad, and one of his favorites has always been Greek salad. But it wasn’t until our trip to Rhodes in October that I realized just how good a Greek salad could be. Since then I’ve become not just a convert, but a full on addict. I’d say that, along with Chicken Souvlaki with Tzatziki, we’ve eaten it just about every week since. It’s so easy to prepare, but just packed with flavors that sing of the Mediterranean. As with anything this simple, quality of ingredients is key. Fresh vegetables and the best feta you can find will elevate this salad from good to outstanding. Of course you can adjust the ingredients to suit your tastes, but it really is all the better for each element. To be honest with you, just five years ago I wouldn’t have eaten half the things in this salad (yes, I had an aversion to cucumbers, tomatoes, olives, AND feta). Just goes to show how much your taste buds can change. Ok, I’m still working on olives, but I’m almost there! This easy Greek salad comes together quickly and is packed for flavor. It's a big hit when entertaining. Put the red onion in a bowl. Add 2 tablespoons of the red wine vinegar and allow to marinate while preparing the salad. Make the dressing. Combine the remaining ½ cup red wine vinegar, olive oil, and seasoning in a cruet. Shake well to combine. Put the lettuce, cucumber, tomatoes, and olives in a salad bowl. Pour the marinated red onion and any remaining liquid over. Top with the block of feta. Gorgeous salad!!!! And you’re right, especially with salads, great quality ingredients are key. I’m still working on my aversion to olives too. I can handle the green Sicilian olives at this point. I’m not sure if I will get beyond that though. Thank you Jennifer! I’m glad to know there’s someone else working on olives! I’ve been actively trying to like them for a few years now, and I’m at the point where I don’t mind if they are in dishes and even enjoy their briny presence on occasion, but I’m not quite ready to munch on them at a cocktail party. I really enjoy greek food and a good greek salad. I love how all of your food looks vibrant and colorful. I could eat that salad right now. Thanks so much Susie! I have been on such a Greek food kick! The flavors are so simple and clean, yet vibrant. Delicious, especially with that block of feta. Love everything about this salad! We always try to have at least one big salad for dinner a week and I am always trying to bring something new to the table. Glad to come across this post, I have never made a greek salad and after seeing this, it is a must try-yum! That is a great, healthy practice Tina. We eat a lot of salad but have actually been pretty bad about it this week. I do hope you give this a try and enjoy it! There just in nothing like good feta, olives and olive oil. I could just have that all day. I enjoyed Greece so much! Looks like a wonderful salad! You are so right! One thing I have learned living in the Mediterranean/Middle East is that there really is a difference between good, great, and spectacular feta! We also get a lot of similar and also wonderful Bulgarian cheeses, which I have enjoyed exploring. What a beautiful Greek salad! It’s my hubby’s favorite as well, but I never make it, I don’t know why, but I don’t. However, if I can find some descent tomatoes, he might just have this next week. 🙂 Glad to hear that you’ve warmed up to the combination with feta. Hope you get the olive in there soon. They are worth – believe me! pretty easy and delicious looking I just love feta cheese! Thank you! I have been all about the feta lately! I love greek salad! There is nothing better in sumer. If you have good tomatoes it becomes heavenly! I so agree!! Excellent, in season tomatoes definitely make this even better! Looking at your fabulous salad makes me want to have some right now. I especially love the red onion addition, yum! Your Greek Salad is perfect Katherine! I know that tomatoes are seasonal but seriously there are not 3 days in a row that we dont have a luscious greek salad on the table..
Coming from you Eri that’s a huge compliment! I know, I can’t get enough Greek salad, even when it’s not summer! That is so true Katherine…I too have developed liking for certain foods which I never thought would ever touch my lips! I too don’t have much liking for olives. The salad is looking so refreshing, I could have it everyday. Isn’t it great how our taste buds evolve? I just love it. Thanks so much!! I don’t eat the salad every day, but I probably could! I love salads like this. 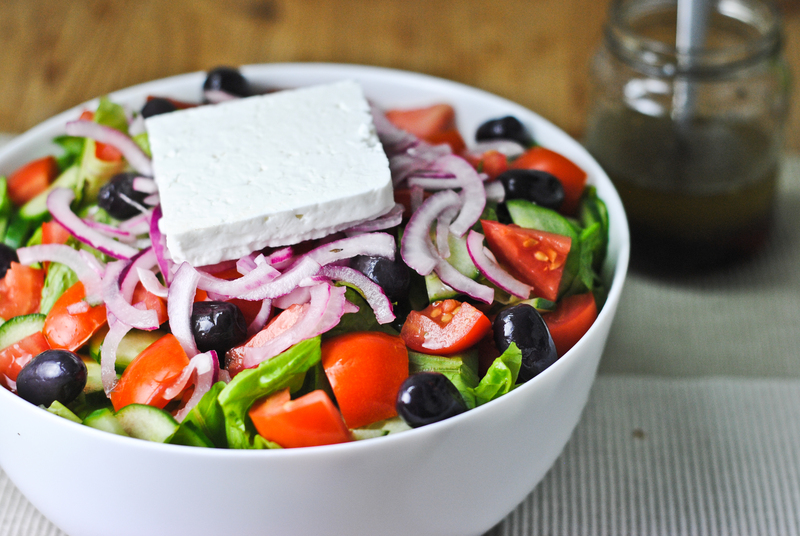 Olives and feta are two of my favorite ingredients in a salad. My children, however, like lettuce drowned in Ranch. Period. Frustrates me to no end. So I make one small tasty salad for my husband and me, while I throw the bagged lettuce to the yahoos at the other end of the table. Great salad Katherine. I worked at a Greek restaurant when I was younger so I’ve made tons of these little beauties. The downside is I don’t like feta so I’d always make mine without it. Lol! Great photos as always. Thanks Kim! What a great experience working in a Greek restaurant! I used to not like feta either, but I’ve come around. Still, it’s good without. 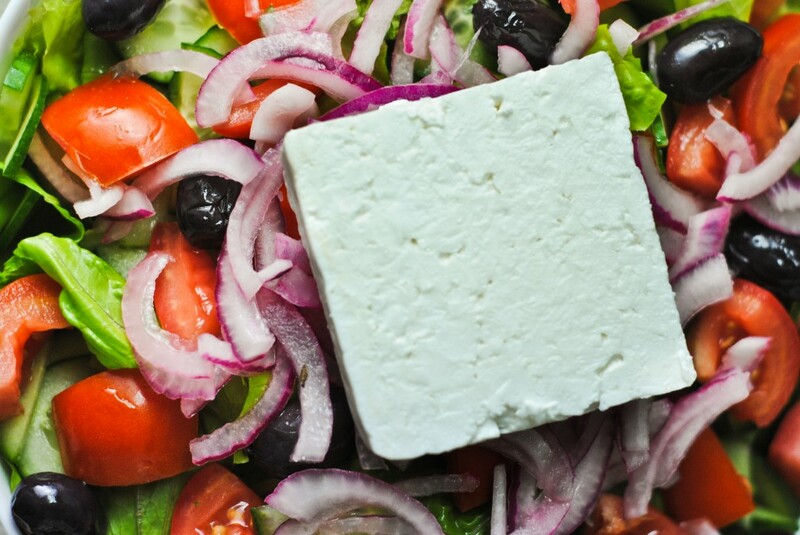 An aversion to feta, (sharp intake of breath here) I could eat feta all day forever until the feta gods have no more 😉 Your salad looks beautiful as does your whole site. Thanks for stopping by Foodness Gracious and I cant wait to ceck out all of your other recipes now! I compromise with my olives and slice them. That way their flavor is more of an intrigue than an assault. I just don’t have the fortitude to pop a whole olive, but in bits and nibbles I really quite like them. Good idea! That sounds about where I’m at. Great recipe..but not all ingredients are available throughout the year.